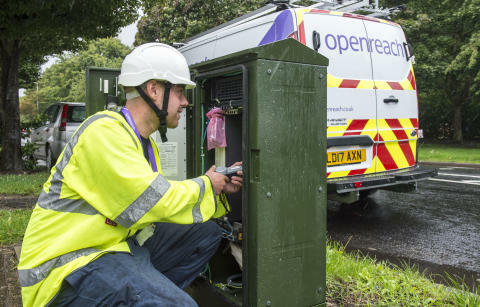 Openreach, the UK’s digital network business, today announced an extension to its ultrafast broadband footprint with a plan to make faster, more reliable services available to just over a million homes and businesses in a further 81 locations across the country. London, Leicester, Manchester, Worthing, Stoke, Birmingham, and Blackpool, are amongst the 81 locations which make up the next phase of the Openreach build programme – over the next nine months - adding to more than 250 locations where the technology has already been deployed. The multimillion pound investment will make faster, more reliable broadband services available to local residents and businesses, helping to boost local productivity and competitiveness, and reinforce the UK’s position as the leading digital economy in the G20. The new Gfast network builds on existing infrastructure and changes the way broadband signals are transmitted from existing street cabinets to boost speeds up to 330Mbps (seven times today’s UK average), without the need to dig up roads and install new cabling. The increased bandwidth is enough for people to support simultaneous 4K video streams in every room of their house, or to hit download on a film just before leaving home and have it ready to watch on their phone or tablet almost immediately. Gfast is also more reliable than existing technology, using special software that can detect and manage service-affecting issues as soon as they occur. The new technology will also provide enough additional capacity to support future data-hungry services and applications, such as Virtual Reality gaming and the smart homes, where a network of online sensors can coordinate and control home appliances – from thermostats, door bells and security cameras to door locks, lawn sprinklers, window blinds and washing machines. Ultrafast broadband speeds can be delivered using both Gfast and Fibre to the Premises (FTTP) technologies, and this latest announcement complements a wider investment programme in future-proof FTTP networks, which is on track to reach three million homes and businesses by the end of 2020. Openreach has already made ultrafast broadband - using a combination of these technologies - available to more than 1.9 million premises across the UK and has ambitions to go even further. The business plans to reach a total of 5.7 million properties using Gfast, and also wants to extend its FTTP rollout to 10 million premises by the mid-2020s if the conditions are right to invest. The company is also continuing to deliver FTTP to rural areas, in partnership with the Government, to make sure some of the hardest to reach communities in the UK get access to future-proofed, FTTP networks. Downloading a typical HD film (size 5GB) would take less time than it takes to make a cup of tea. Ultrafast broadband would download it in less than a minute, meaning there will be no waiting or buffering. Businesses, or small businesses operating from home, will be able to complete on a level playing field with competitors from all over the UK and around the world. Uploading and downloading large files will be easier as will things like remote monitoring, video conferencing and streaming. For example, ultrafast speeds mean businesses can transfer data over the internet faster that you can write data to a thumb drive. Plus you can download data as fast as many computers can save the data to a hard drive.